With your Bread Loaf Baker, you can make all types of homemade bread (sandwich loaf, gluten-free, rye bread etc.) with a crusty outside and a soft inside. Prepare your bread dough and leave it to rise in a covered bowl, protected from any draughts. Grease the base of your bread baker generously, on the bottom and the sides. Then sprinkle some flour inside. After the first proving, remove the air from your dough by kneading it again, then place in the bread loaf baker for the second proving. Cover with the lid. Leave the dough to rise a second time. The volume it reaches during the second proving will be the final size (more or less) of your loaf. Just before baking, brush the surface with water. Unlike baguettes or bread rolls, you do not need to score the surface. The small holes in the base and lid will allow the carbon dioxide to escape while baking, at the same time retaining a high level of humidity, resulting in a crusty loaf. Before using for the first time, remove all the labels from the product, if necessary using a mild detergent, then clean carefully. The Bread Loaf Baker is designed for use in a traditional oven. 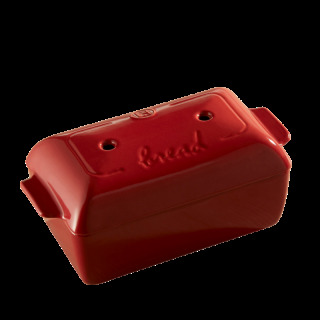 Its refractory ceramic dome recreates the correct level of humidity your bread needs to bake properly. Do not use your Bread Loaf Baker on a source of direct heat (gas, ceramic or electric ring). Thanks to its highly resistant glaze, you can use metal utensils without scratching the surface. When the dish is hot, do not place it in contact with anything cold, such as cold water or a cold surface. When you take it out of the oven, place it on a neutral surface, such as a wooden board or cloth.